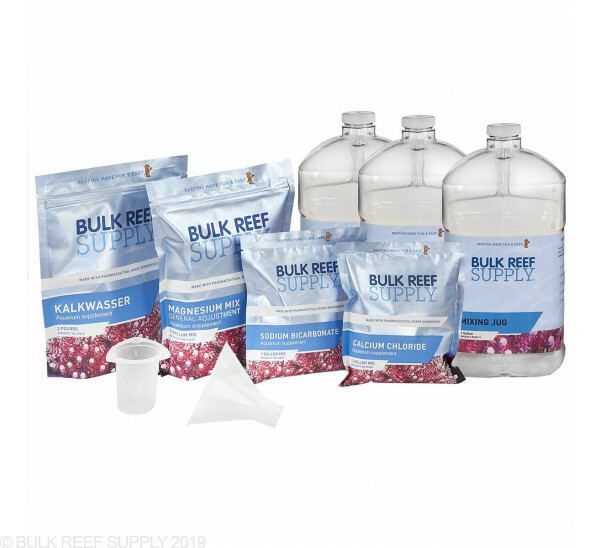 Everything you need to maintain calcium & alkalinity in your reef tank! BRS Kalkwasser is not your typical calcium hydroxide. It is made from an ultra-pure source that contains extremely low amounts of aluminum and compared to traditional kalkwasser you can actually see the difference. If you are adding Kalk to your ATO reservoir or a reactor, you will find that BRS Kalkwasser mixes faster with fewer impurities, and is more even potent than the others meaning you will not have to use as much, saving money in the long run. The two-pound kits come with everything you will need to get started. 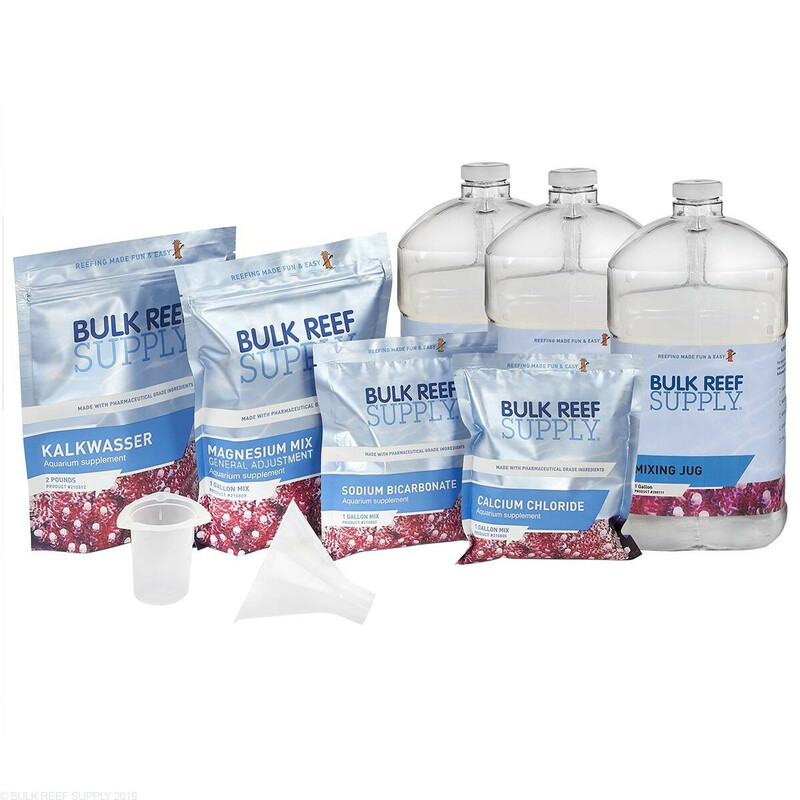 The kits include calcium chloride, and sodium bicarbonate (alkalinity), and magnesium to get your reef balanced before using kalkwasser. All you will need to provide are the test kits, mixing jugs, and water. The 2-pound kit is great for reefers just getting started with calcium and alkalinity maintenance. If you have a nano-sized tank or even a larger aquarium with minimal corals, the pre-measured pouches are super easy to mix, requiring no measuring before mixing. Step 1. Test and adjust your aquariums calcium, alkalinity, and magnesium levels using the included BRS Pharma Calcium Chloride, BRS Pharma Sodium Bicarbonate, and BRS Pharma Magnesium. This is the perfect package. These mixed up very well and brought my Alk, Cal and Mag levels up to where they need to be. The calculators on BRS worked perfectly for the new pharma grade pouches as well. The mixing jugs were nice also and made everything a breeze to set up. Be careful when pumping the jugs at first, it takes a little force to push down and the liquid can come shooting out. I think its just because they are brand new pumps and has already become easier to control when filling the measuring cup. Thanks BRS! I liked the product and the directions were clear. I am using the kalkwasser for two weeks now and my calcium and alkalinity level are where they should be. However, BRS should have a nano version since many people will not use all of the product. Recently order this starter kit as it is my first time dosing Kalk. Everything I needed was included and it makes it so easy. Well done. Everything is high quality and wonderful. The instructions are generally clear, but require that you read them a few times. Just double check yourself, i almost read them wrong the first time. I got everything up to where it needs to be this weekend, particularly the ALK, from about 4-9 over about an eight hour period, and Mg from 1200-1350. Calcium was OK. Having done this, I can now I can add Kalkwasser in my ATO in an attempt to keep ALK in range. So all good, but for my 32G it's far more than I need so I've got a lot of Starter package left over. Too bad they don't have a nano version, or the like. Another hit from BRS! This package, coupled with the videos and other instructions, is a terriffic way into the world of Kalkwasser. One recommendation would be to offer a "total" package that includes the gallon jugs, the 1oz. dispensing pumps, and perhpas a 1 gallon mixing container. Secondly consider, placing the "You Will Also Need" segment from the printed instruction sheet under "Full Details." I'm new to reefing. Bought this product based on the YouTube videos. After 3 weeks my tank looks much better. I currently have 1 frag of zoanthids and since I started dosing they look much healthier and have started to multiply. this is a great kit and has everything to get your numbers up and keep them up. seems very pure and performs just as expected. Holy powder Batman!! Ton of Volume!!! Perfect Kit to get things going in the right direction. Follow instructions+ watch videos+ use calculator=perfection every time! You really do get alot for what you pay for maybe to much(not a bad thing). The videos helped me out alot as I was new to dosing. Mixing each element was not as hard as I thought it would be either. This is an all around awesome package. After I got all my parameters where I wanted them I didn't think I would need the alk or cal solution but after a few water changes I noticed my cal jumped up but my alk didn't. I had to stop using kalk for a little bit til my cal went back down and dosed only the alk solution to keep it stable. This is an all around awesome package.